You can import and export terms in AtoM using the Simple Knowledge Organization System (SKOS) format, described as a “W3C recommendation designed for representation of thesauri, classification schemes, taxonomies, subject-heading systems, or any other type of structured controlled vocabulary” (Wikipedia). The following documentation will introduce term import and export via the user interface. AtoM supports SKOS RDF imports via the user interface for the import of terms, to be used in taxonomies in AtoM. The most common reason terms are imported are to add a list of controlled values to the taxonomies used as access points in AtoM, such as Places, Subjects, Genres, Actor occupations, etc. SKOS RDF data can be serialized into many different formats. On import, AtoM uses a third-party library called EasyRDF to parse and consume the SKOS data - so multiple different serializations are supported for term import. Examples include SKOS RDF XML, Turtle, N3, etc. SKOS files can be uploaded locally, or if you have a URL to the .rdf SKOS file of your terms available online, then AtoM can fetch the terms from the web directly. To be able to import terms remotely from a URL, the URL must point directly to the SKOS RDF file - generally, this means the URL must end in .rdf. An HTML landing page for terms, made for easier human readability, will not work! Because the AtoM job scheduler manages SKOS imports, an administrator can always review the status of any SKOS import on the Jobs page - the console output of the import task will be captured in the Job details page of the related import job - see: Manage jobs for more information. This can be useful for troubleshooting as well - any warnings and errors generated on import will be captured in the console output. Click on the import menu, then click on SKOS. AtoM will redirect you to the SKOS import page. 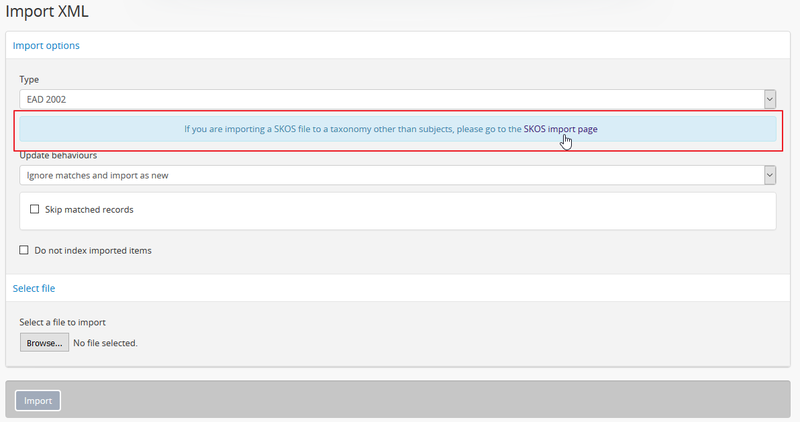 The “Taxonomy” field on the SKOS import page determines the taxonomy into which your SKOS terms will be imported. This field is an auto-complete - as you begin to type the name of the target taxonomy, matching results will appear in a drop-down menu beneath the field. When you see the target taxonomy, click on it in the drop-down menu to select it. AtoM currently defaults to “Places” in the taxonomy field. Users can replace this with the name of any taxonomy by typing it into the field. To upload a local SKOS file for import, click the “Browse” button to open a window on your local computer. Select the SKOS file that you would like to import. When you have selected the file from your device, its name will appear next to the “Browse” button. To upload remote SKOS RDF resource from an online source, enter the URL into the Remote resource field. Remember, valid URLs must begin with http:// or https://, and end in a .rdf file extension. 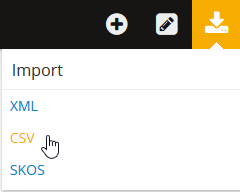 When you have configured all the options, click the “Import” button in the button block at the bottom of the SKOS import page to begin your import. Depending on the size of your SKOS import, this can take some time to complete. Be patient! Remember, you can always check on the status of an import by reviewing the Job details page of the related import job - see: Manage jobs for more information. After your import has begun, AtoM will reload the SKOS import page and indicate that the import has been initiated with a notification at the top of the page. This notification will also provide you with a link to the Job details page of the related import job, where you can check on the status of the import. You can begin another SKOS import at this time, or navigate elsewhere in the application. AtoM supports SKOS RDF XML exports from the term view page. When exported, the term currently being viewed, as well as any child terms, will be captured in the SKOS XML generated. SKOS XML exports are available all users on the term view pages accessible to public users (such as Subjects and Places). Some taxonomies in AtoM are not publicly accessible, and therefore only authenticated (i.e. logged in) users will be able to export them. SKOS XML term exports are not currently supported by the job scheduler, meaning they are generated on-request. This means that very large hierarchies may not be able to be exported via the user interface, as the browser’s built-in time out limits (to prevent long-running requests from consuming all available resources - usually about 1 minute in most modern browsers) may be reached before the SKOS file can be generated. At this time it is not possible to export an entire taxonomy - exports must be initiated from the top-level term view page. Navigate to the term(s) you wish to export. You can access terms by navigating to Manage > Taxonomies, selecting the taxonomy that contains the terms you wish to export, and then finding the term and clicking on it. Alternatively, if your term is part of the Subjects or Places taxonomy, you can use the Browse menu located in the AtoM header bar to access those taxonomies. Click through to the term’s view page. In the right-hand context menu of the term view page, click on the SKOS button under the “Export” heading. AtoM will reload the page to display your SKOS XML. You should be able to right-click in your browser to save the page. Be aware that some browsers (e.g., Safari) may only allow you to save the Exported SKOS file as HTML. Firefox and Chrome provide the ability to Save page as XML, which enables Importing as XML into another program or into another version of AtoM. If you have problems with the save options provided by one browser, we suggest trying another if possible.